The lure of a long swim had been hanging over me for many years. The lure of the Channel however, not so much. With its tough currents, temperatures and tricky departure windows due to the weather and tough acclimatisation Dover swims has always just been too much of an organisational nightmare. 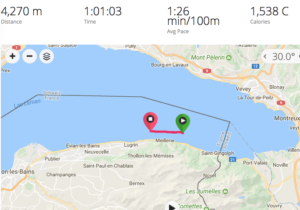 The chance to swim a relay the length of Lake Geneva at 70km had other challenges but appealed as it was slightly easier to prepare for and enter. Endurance and lack of sleep being the key issues. 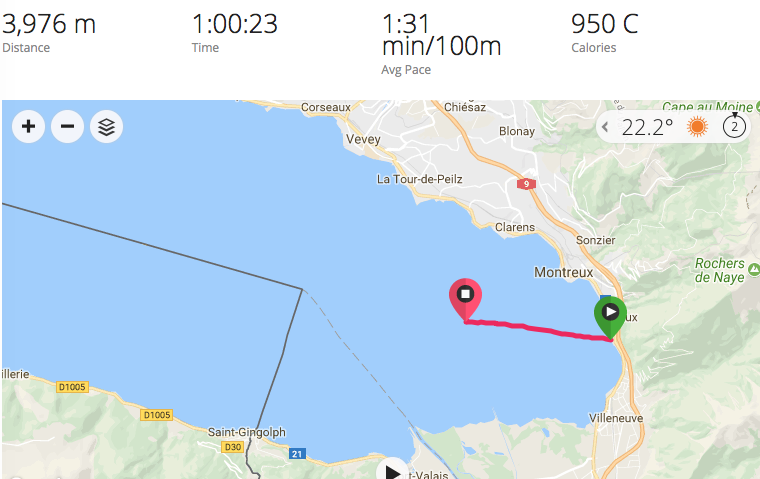 This was going to be 5 or 6 x 1hour swims with 5hours rest between each if all went well in terms of manageable distances each hour from the team and the weather being kind. I had hoped for 4km averages in early discussions but this was all down to the weather. 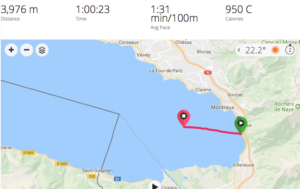 Lac Leman is big enough that it does have some widely fluctuating temperatures, weather fronts and currents as various rivers flow into it from various high cold places. I trained for the event on the VASA ERG swim bench which is my preferred method as it does not involve a ‘surface recovery’ only a submerged pull. I like to race long distance open water swims but I struggle to train long in the pool. Despite my many hours of ‘prehab’ strengthening my shoulders and keeping them healthy I can only swim 2-3x per week and only 5km max before the shoulders start to complain. I also use the rowing ERG a lot, 60mins of ‘dull’ rowing is great preparation for 4-5km of swimming. It works all the body and toughens you mentally. I also try to race a lot in the summer once the season opens. I find Race Preparation great training as it gives you a chance to go hard, to encounter real swim scenarios <goggles snapping recently in the Oxford 4km race> and put your swim technique under race stress. 70km is big, so big I had try to put it out of my mind but as you sit on the train for 90mins travelling from Geneva along the edge of the Lake around to Villeneuve it is hard not to ignore. I was the swimmer in our team of 6. Lorraine, Kate, Elsa, Dipa and Lisa all keen swimmers but I had the swimming background and I was trying hard not to show my nerves for fear of worrying them. I was first off the beach and wanted to get a good start to build some momentum. We were blessed with great conditions from the weather, no surface waves and minimal currents but Jacque our pilot warned of harder efforts ahead. We boarded on a small jetty and sailed over to the start where I would enter and swim back to shore and meet Ben our LGSA swim rep and contact for the official start. The swim happens under strict Channel Crossing conditions and so we had an official observer with us. The water was warmer then I had anticipated as I got in from the boat to swim back to shore. You can’t help but feel you are in a beautiful place when you start a swim event next to a medieval fortress. 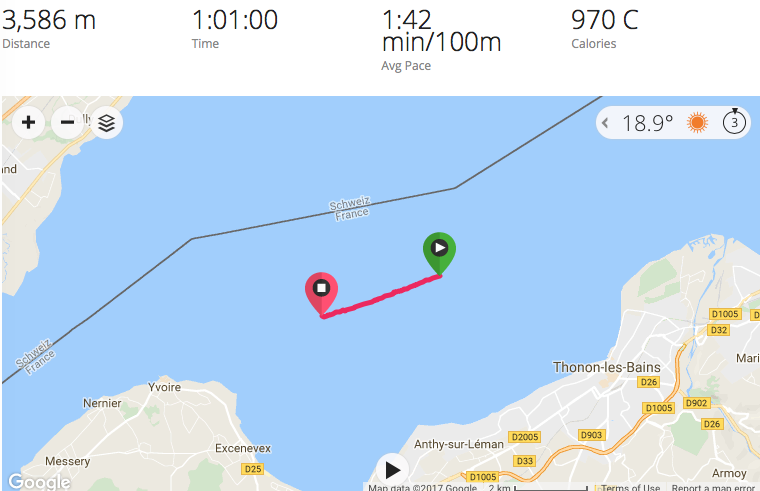 Recent swim competitions had gone well and I felt my numbers were good in terms of fitness so swimming hard for an hour was not the problem but I would ease into this first swim after a long day of travel just the day before. My 3rd swim I calculated would be at 3am mid lake in the cold and dark. Two key areas I just had not had a chance to prepare for that well. Closing your eyes for 6 strokes during the Great London Swim is not quite the same. This was going to be my real test I thought. No wetsuit would be interesting as I enjoy the freedom of nothing around the shoulders but the free speed & enhanced body position suits my swim technique. I felt good during the first swim and without a warmup was ok with 3.9km but then I got side tracked with unpacking settling into boat life. 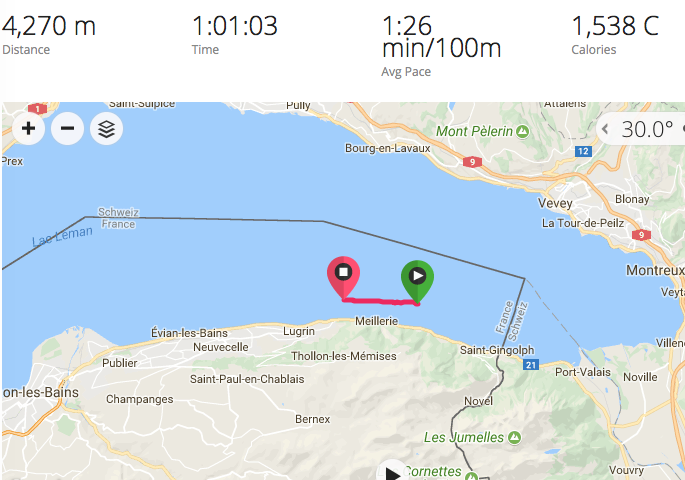 It is amazing how quickly 5 hours comes around as you cheer and support teammates, apply sun cream stay hydrated in hot conditions and start checking route, currents and progress. 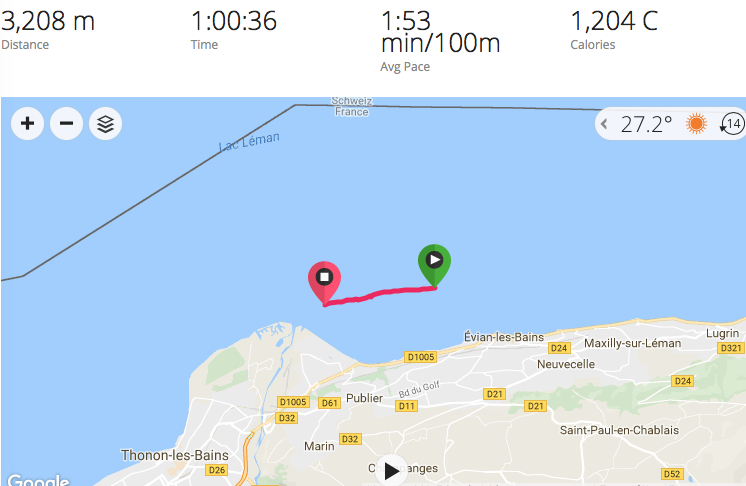 I forgot to eat during this busy time and during my second swim my arms faded towards the end leaving my thinking the next 4 swims would be really unpleasant. I had literally packed a suitcase of food so this was just a silly thing to overlook but with the beautiful conditions and amazing scenery, easily done. 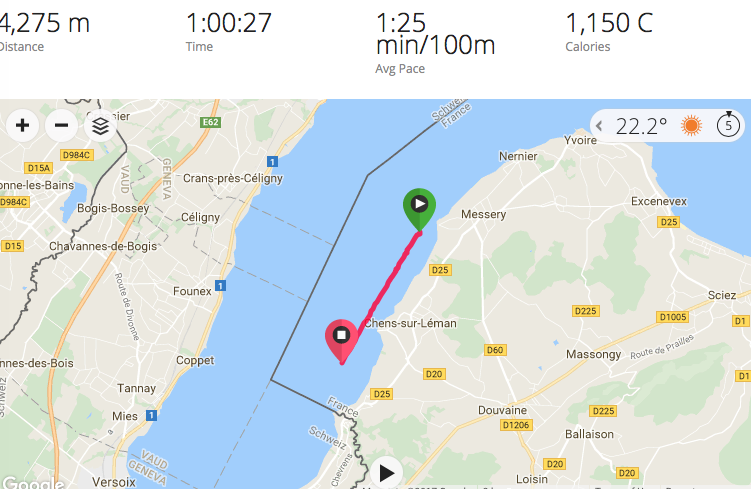 The 3rd swim felt quite tough and the numbers suggested it was really hard going. I had fuelled well for it and Jacque could see my disappointment but he said this part was notoriously quite slow given the currents. He felt the boat drag. This was good to hear after the tiring 2nd swim that I felt I might not have recovered from. 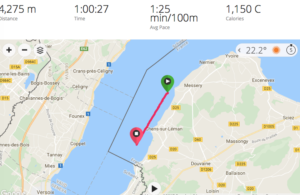 We were not half way and I did not want to be slowing to 3km/hour otherwise the team would be into 7 swims each territory and this was something we had not planned for. Not just in terms of fatigue but time allowed on the boat, water and food supplies were also a factor. The stars were out for my 3am swim and it was pretty. But it was also a cold part of the lake and despite years of getting up for early morning practice jumping in to the lake after a 2hr nap I was not at my best. Worries of swimming into something, being brushed by a weed were also nagging doubts. All day I had been watching the lake and had to admit problems were unlikely. I had hardly seen a twig or leaf in the water all day. 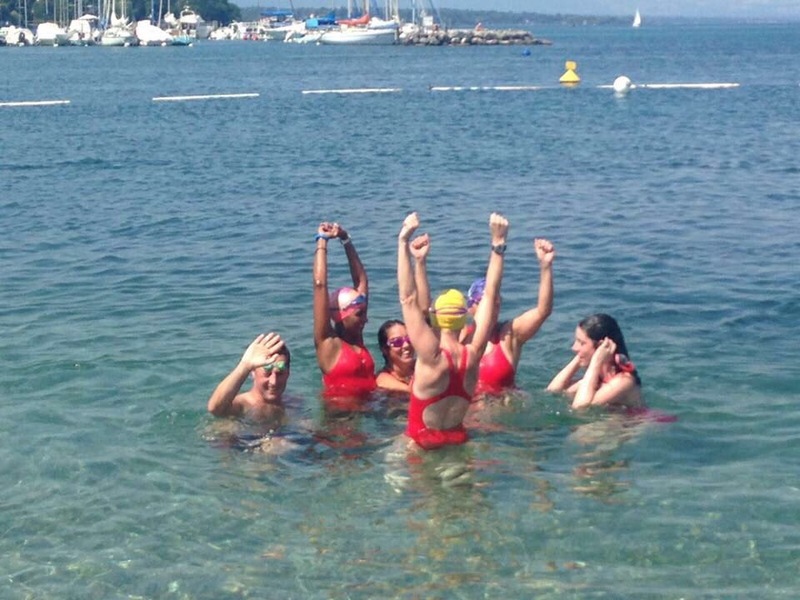 The water in Lake Geneva is some of the best I have ever swum in. Breathe right to the boat, just keep going until you see the lights blink and the hour will be up before you know it. It is an interesting phenomenon that with each passing hour in the water the hours do feel like they speed up. The boat looked pretty lit up with neon glow sticks I was thinking of the Inbetweeners boat party for giggles to keep me going. I was also counting 70 strokes repeatedly helping me tick off the 100m blocks as this is usually my stroke count. Getting close to 3.6km was good given the time and conditions. I was recovering and fuelling well now and felt fit and strong. Regular stretching and band work on the boat were keeping shoulders in check and food/rest/nap was now on auto pilot. 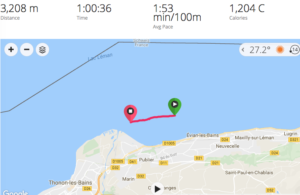 SWIM 5 – decisions decisions. We were getting close, once around the left hand outcrop of Yvoire we would see Geneva for the first time. Go for it to try a big effort so that we would all be done on 5 swims each. Miss this though and be tired for another 60min block into the finish would be heart breaking. We were warned the SW winds would increase around 4pm and the final few km into the finish would be tough due to the extra boat traffic. I decided I had to go for it and ty to inspire the team for one last swim. I jumped in and felt great by some odd chance. Jacque our pilot said this would be a fast section due to the narrowing of the Lake and to take advantage. I stretched my stroke out in an attempt to be economical but fast with the addition of the flow. I did not need to up my cadence to fight tougher water for now. That was going to be likely in swim 6. As mentioned the hours were getting quicker and I was out before I knew it, a quick calculation suggested we were at 57km. At 2km averages for the next 5 swimmers I was likely to have to get in again which would be tough but I was secretly delighted I would likely finish the swim for the team. The last few km into the finish were as promised the hardest, it was late afternoon, the wind was up, the boats were out and despite the great earlier conditions the Lake was not going to give this to us easily. Finally, it was like being in the sea with good waves and swell to contend with. The team were amazing and followed me in for the last 300m onto the shore where our official observer took our time. As a former swimmer I had all the skills to accomplish this. I once swam 16km in a winter training single session at Ohio University with Scott Hammond our coach. The others in the team not only had to deal with the cold, the dark and the distance but also work on swim technique and efficiency during busy work lives. I take my swim hat off to them. Well done Lisa, Elsa, Kate, Dipa and Lorraine. Thanks especially to Lorraine who made it happen with sponsorship as 2day boat hire is not cheap! The big round thing at the end of the pool? Maybe to the side of the pool? Usually decorated with a blue/red bar across the middle? The bar usually moves in circles, through 360degrees. Maybe now? Divided up into 5sec increments around the edges from 0 at the top? The Clock! Yes that’s the one and it is there to help your Training. It can tell you more then just how fast you covered that last 100m and how long until you start your next swim. With some ingenuity you can use it without the need for a clumsy watch at your wrist to count the number of repeats you have completed and also present a reasonably accurate Heart Rate measurement. We will start with an easy exercise first to get the hang of some of the basics. We will also need to get familiar with some basic swim training terminology as well. Try 5x100m FC off 2:15, basically 5 times 100m (4 lengths in a 25m pool) and you rest until 2:15 expires when we start repeat No2. If we start on the Red 0 then we will start the next repeat on the red 15, the third on the Red 30 and so on. If we have an approximate idea of our best 100m (i.e. 1:40) then you will possibly come in on the RED 50 (1:50 for 100m) after the first swim. It is unlikely you will suddenly swim 2:20 or 1:20 so we should be able to avoid Red/Blue confusion. We get 25secs rest so we will we go again on the RED 15. Perhaps next swim we return on the RED 3 so we have swum 1:48. We rest until the RED 30 and commence with 3rd 100m repeat. Noting the time it takes to complete the 100m is often just a case of subtracting or adding positions on the clock. RED 15 to RED 3 is 48secs. From the earlier assumption you can also deduce it will be 1:48 rather then 2:18 or 1:18. Another way to look at this is to think about how the interval patterns move around the clock. To swim 50metres choosing an interval of 1:10 for instance. If you start on the BLUE 0, finish your 2lengths of the 25m pool on the BLUE 50 then we get to rest 20secs before commencing the second 50m on the BLUE 10. i.e. Another 50sec swim will have you finish on the BLUE 0 before we set out again on the 20. With 12 x 5sec increments marked on the clock 6x50s will have us finish on the 0 again having worked our way around the clock, starting each 50m 10secs later. The last will see us push off on the 50. No7 would have started on the 0 again for a second block if necessary. For intervals over 60secs we move clockwise around the clock face (Consider this a positive interval). You could move anti clockwise if you chose a tougher interval of 55secs for instance. 12x50metres of FC off 55 sec would have us depart on the RED 0 and then depart after our rest period (possibly not much now!) on the RED 55, then the RED 50. The 12th 50m would start on the RED 5 and have us again complete the set by the RED 0. No13 would have seen us depart on the RED 0 again. Intervals of 40 or 1:20 (for 25metres or 75metres possibly depending on ability) would see us either move around the clock anti clockwise or clockwise using the 0,20 and 40 as our departure points. The clock can help count the number of lengths we have swum during longer swims if you keep on eye on it. Suppose we set ourselves a swim of 400m (16lengths in our 25m pool.) You might already have an idea of your best 400m time, but it is not so important if you do not have an accurate best time. If we start on the RED 0 it is helpful to check the 2length split but not essential. If I see the RED 50 as I touch at 50m then if I have not gone out too hard I should be approx 1:45 (RED 45) at the 4length marker. If you are turning and the clock is at the other end of the pool then this is an ideal opportunity to practice looking up to sight the clock. I would start these swims at the opposite end to the clock for least disruption to your stroke and rhythms since the sighting movement will be most natural. If the clock is to one side then a breath to the side out of the turn will enable a quick snapshot. Pace control helps and this regular checking of time will guide you. At length 6 we should be seeing RED 40, then RED 35 for a 3mins 35secs 200metre split. The pattern of subtracting 10initially then 5secs with each swim will have us move anti clockwise around the clock. If you lose track as I usually do at around lengths 10 or 12 then we can just check the clock position for an update. Sighting the RED 25 tells me, providing I am swimming similar stroke counts and keeping my HR consistent then I am highly likely to be at 12lengths. Another 4lengths and I will finish on the 15 for a 7:15 swim, which was nicely even splitted off of the 3:35 halfway point. The very first two lengths are generally a fraction quicker due to the more accurate streamlined push and glide, the lower fatigue having just come off a rest and general sensation of easy speed. The key thing to recall is which top you started on! At this point you might be feeling surely it is easier to wear a watch or rely on the person in front to do all the counting for you. Keeping a track of your own splits and lengths brings ‘interest and variety’ to your swim, keeping you occupied. It will help with pacing and along with counting strokes provides an almost instant assessment of swim efficiency. It might even keep your mind off the drudgery of a less then exciting swim. Swimming with a watch regardless of size, to me still feels clumsy. Most would avoid wearing their key from a locker at a public pool around their wrist. Both occupy space at a critical part of the arm that needs to feel clean as it enters the water and strong as it sets up an ideal hand, wrist, and forearm position for the pull phase. A useful clock agility set to try is as follows. You can see patterns emerge as you arrive and judge your rest and calculate your departure time. The following could equally work with 25m, 33m or 50m swims depending on your ability. First we will demonstrate this with a positive interval and work from the 0 down to the 30. We will then repeat with a negative interval. RED 30; swim 1 repeat inside of 70secs and finish. BLUE 30; swim 1 repeat inside of 60secs and finish. To further help you keep track of your swims we could set an interval that would help perform the counting for us. Choose a top (BLUE or RED usually) and stick with it. Again depending on ability this might work for 25m, 33m, 50m or even 75m. We swim each repeat within 61 secs. RED 19; swim 1 repeat inside of 61secs and finish for 20 swims. For a more dramatic climax you could always count the number of repeats down. Start a set of 15x100s off 2:01 on the RED 45. With each swim we get one notch on the clock closer to the top. Its just psychological but we usually get better performances in the pool when we count down from 45 rather then up to 15! For those stronger swimmers the start of this set will be not too challenging but once we are into double figures then suddenly it gets very tough. i.e. A slightly less intense session that offers a challenge to all, is to swim 20x50m off a 91sec interval. This gets a little trickier. There are 2 ways to do this. The session starts deceptively easy for most and I almost had a few moans about too much rest but once we were into double figures it started to take its toll. Especially when coupled with the idea of getting back before the RED/BLUE 0 (Option 1) with each swim. So break a minute on the first swim, then 59, 58 as you leave later but come back on the same time. At numbers 17+ you are in the low 40s and it will be challenging! Another use for the big mostly redundant circle on the wall enables you to do away with taking another item to the pool. Without a Trisuit on covering the belt and stopping it flapping around when swimming I find a traditional HR monitor quite intrusive and distracting. Swim Club coaches often use the Equine Hand Paddle option to quickly get a reading of their swimmers efforts. In a squad situation this might make some sense but you could consider an easier if slightly less accurate option if on your own. As soon as you finish your repeat find the strong pulse in the neck, the Carotid Artery and press with the fingers. Use the clock to count the number of beats in 10 secs and multiply this by 6. Not exactly NASA high tech accuracy but not a bad guide to your training intensity. With frequent use it will act as a benchmark and to see similar times maintained as the HR falls or the HR maintained as you get faster will be a good indicator of improved fitness. that captures real-time heart rate, stroke type, and laps. and presented in a mobile app.” This product has been floating around for a few years now but is still struggling to take off so for now how about giving our old friend on the wall a chance?! Can’t we all get just along? As you pay anything from between £4-£6 for a public swim you get to rent a space in the pool for a certain period of time. For your entry fee you get to displace a similar amount of water to me, other Triathletes, the slow Breaststroker, the Olde English Backstroker and even the Sidestroker. Unfortunately, this amount of £ does not get you your own lane and somehow we all have to get along. I don’t think we are at the stage of the cyclist/car user and that whole debate but we do have a quite different array of abilities, arriving differently equipped (wanting to use different equipment at least) and needing to share a common lane space. I have been moaned at for swimming too fast in the fast lane with Stuart Hayes since a regular fast ‘laner’ was now not quite fast enough to jump in and hang on. I’ve swum with & witnessed James Beckinsale and Gill Sanders being moaned at during her Olympic preparations for being too fast in the usual fast lane. There is a lot of common sense that gets left in the changing rooms by all (and I mean all of us) when it comes to public swimming and we are all guilty. Public session means exactly that and those slower and faster then you or I have paid to be there and while irritating as that might be they have as much right as you or I. When those goggles/blinkers go on and the reps start accumulating though the last thing you want is someone ruining that one good effort when it was all falling into place. An OW swimmer did not hesitate to moan at me for swimming a length of legs only in a warm up so they had to overtake me recently. Should I have moved lanes for a single length? Could the OW swimmer have been more tolerant? If I had been kicking Breaststroke and so becoming an obstacle and inconvenience to his swim I think fair point. I should have moved but more importantly I would have moved. All pools should have a Breaststroke lane for safety reasons. Some pools are now offering double width lanes so that overtaking is easier and safer. There may be some logic to this but usually this large channel in the middle stays quite empty and we have one big lane operating at a certain pace. Since many pools are 6-8 lanes wide to offer double width reduces the number of lanes available. With more single lanes more ‘abilities’ could be catered for. In the larger 8 lanes pools with singles lanes set aside for perhaps half the pool even other strokes would now have a safe harbour. A slow, medium, fast and strokes lane would help cater for more swim abilities. But what is a slow lane? A fast lane? It varies doesn’t it? At masters Swim Meets in the warm-ups they are usually segregated by times, lane1 is for those usually repeating 75secs per 50m and advancing across the 8lanes of the pool to 40secs per 50m. Slow, medium and fast demarcations at the end of the lanes don’t help, as the unfortunate regular ‘fast lane’ swimmers found out when we encroached on their space. As conditions dictate, some days you might only be a medium swimmer. Maybe those Slow, Med and Fast signs should have some average times on them to help people figure out where they should be. For the new Speedo On platform we spent hours figuring out Beginner, Intermediate and Advanced paces for Adult swimmers not from a swim club background. It took days! I have had discussions with pool operators pointing some of these findings out since I often hire pool time, a few lanes at a time, during public sessions and witness the carnage that goes on. Lifeguards could act if it does not take too much away from the important duties of observing the pool and help move swimmers up and down lanes to keep the harmony but its never caught on. Most lifeguards spend most of the day cleaning. Ultimately though my business is to help people swim faster which is why I hire lanes. If you are serious about your swim improvements please consider a Tri club, a Masters Team, a coaching organization with hired lanes. Discipline, protocol, a conductor at the end of the lanes orchestrating your fitness in a controlled and safe environment in a social and competitive arena (when appropriate) has to be worth the extra money. These sessions usually work out to be no more then double the cost of a regular pool entry so given how good a supervised swim session should be and how much of a waste of your time a public session could be budgeting for structured sessions is something to add to your annual Fitness Budget. If you work shifts or odd hours and structured team sessions just are not going to work, then here are some guidelines as to what kind of session might just work a little more effectively in a public session and how. Either avoid single lengths on a strict interval or swim them to a more relaxed interval, perhaps use the rest needed waiting for space to dictate the pace of the next length. If you get caught and need to wait for some space pick up the pace on the next and aim to ‘catch up’ the swimmer in front. Really give them some space though, remember a good streamline off the wall will shut down a large gap on an average swimmer. If 3-4 are in front having just pushed off in succession while you rest and coming into the wall are 3-4 more then take that spot and swim steady to recover on this repeat. Too much rest will make the set redundant and leave you possibly cold while you wait around too long as the next group go by. Use HR to measure recovery rather then time so the set is not quite so regimented to the clock, which is where a lot of frustration creeps in. 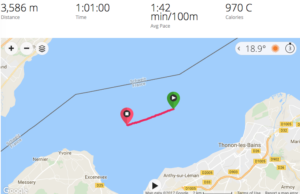 You can be sure that the second you want to get going on a certain interval a chain of swimmers will appear from no where and disrupt your swim. Choose an appropriate distance/main set of repeats and allow your HR to recover by 30-40 BPM between swims or as appropriate to the training effect your coach is trying to create. Fartlek training is highly adaptable to the pool and can help create a long distance block of multi paced/multi effort swimming. Runners use it and there is no reason why it will not translate into a swimming main set. You can make use of a distance to swim steady and a shorted distance to swim fast or you could choose a number of strokes to swim strongly before doubling that number for an easy block. A water proof MP3 player with play list could also be set up to create different length tempos. Random up-tempo pace sections are good fun when you need to overtake, read on for more details on how to overtake safely. A strong fast overtaking maneuver will really spike the HR and allow a good training effect. No wall open turns are on option to stay out of trouble at the wall. Rather then get caught up in the mass of bodies resting along the wall you could if it is clear & no one is about to push off perform a roll turn into the wall but not touch it and swim away from it. This will avoid the temptation to stop, rest, chat, moan or procrastinate the rest of the session with the others hanging around. Avoid paddles as they invariably will clip someone accidentally and lead to some kind of argument or if necessary keep to the small so that they do not protrude from outside of the hand too much. The soft mitts many manufacturers offer are of use at this time despite performing a much different swimming sensation, they are a lot safer to use in a busy public session. Get your kick set done in a lower lane at the end of your session to keep clear of other swimmers and avoid Breaststroke kick. Breaststroke kick is the most violent and powerful of all the kicks. Most people do not realize how wide their kick is on Breaststroke, which leads to many issues. The following will also apply to a structured team session and help everyone stay safe and keep the lane harmony to its fullest if some or all could be incorporated. Never suddenly stop in midstream unless it’s an emergency, it’s extremely disturbing for anyone immediately behind you. If you do suffer from cramp or lose your goggles, try to turn sideways and move to one side of the lane quickly so that anyone behind can still continue to swim past you without interference. The swimmer behind you can only base their swim movements (i.e. plans to overtake etc) on what they expect you to do and where they expect you to be. Sudden deviations from this will cause problems and lead to crashes. Overtaking in the first two thirds of the length: you should move into the middle of the lane checking there are no oncoming swimmers in front. After a gentle and polite tap of the person’s feet in front move around them quickly. It is your responsibility to get around the person in front safely and quickly the swimmer in front should not have to change their swim to accommodate you. Slowing down a fraction if it is you being overtaken I am sure would be appreciated from the person doing the overtaking. With this in mind, as mentioned, the person in front should not attempt to help the person behind by moving around or getting out of the way. The person behind cannot anticipate these unexpected movements. Overtaking into the wall, i.e. the last 3rd of the length: It should be a natural movement for any swimmer to move towards to the centre of the lane as they approach the wall from about the flags in to execute their turn centrally. This will aid a smooth movement to the opposite side of the pool for the next length. From this you can see overtaking at this point can be quite hazardous. If you plan to overtake someone in this area it is best to ease back a fraction, allow them the centre line and you should stay towards the side of the lane that you had been swimming up. As they move to the centre and push off to the opposite lane side you will turn and push off into the centre of the lane immediately setting you up to remain centre of the lane for your overtaking attempt in the first third of the next length. At this point you can see it’s important to check behind to be sure no one is attempting to overtake you. Intervals: 5second gaps are designed to allow you to swim your own swim without immediately gaining a tow from the swimmer in front if you push off too soon. Please be accurate with this, don’t be a drag queen. 10 sec gaps if possible would ensure you get your best-unaided swim with no draft from the person in front. If you do swim on someone’s feet you really are not putting in an individual effort. You would be vilified on the bike for doing this for too long so try not to let it become a habit in the pool. Leading a lane means you are working harder then those following. You get more out of the session than those following and will reap more from the time put into the session. If lane one swims clockwise, then lane two should swim anti clockwise and so on across the pool. This way you both lanes travel in the same direction when you are closest to each other side by side. This will help reduce crashing arms from any oncoming swimmers in the next lane whose hand trajectory is a little lower and wide. Not adhered to on the continent but crammed into our small 25m pools compared to the multitude of 50m pools there with our narrower lanes perhaps it is a good thing that we are a little more careful. Regardless of swimming clockwise or anticlockwise stay over to the side of the lane, keep the ‘middle’ lane of the lane free for overtaking. Being courteous to your fellow swimmers will go a long way. Also to your coach – If late, it is polite to get in at the back of the lane and proceed with the current set, slowly getting warmed up until you are ready to resume your normal position further up the lane. Ask your coach what the set is rather then jump in sneakily and follow hoping to figure it out. It is courteous and will stop you swimming into the back of the person in front when they start to unexpectedly kick and you did not notice. Bring two sets of goggles with you so that if there are any leaks, then swap them. Try not to sit there for 10 minutes fixing them. This infuriates coaches. Shower ahead of time; wear Flip-flops on poolside and swim hats in the water. This would be a great help to allow pool operators to start using fewer chemicals. We would all benefit from this and you’re more than likely going to race in a swim cap anyway aren’t you.